Cliff invites those of us who read this column to come share a nostalgic walk that will take us from the past right up to the present day. This chronicler found himself pulled irresistibly into Cliff’s narrative as his story awakened in me the commonality of the lives of working people of that era. It is my hope that Cliff’s story arouses a personal recognition of the small dramas and major catastrophes that define your story as well. Sitting in Cliff’s front room with a glass of wine, a platter of cookies, and Gayle furiously long-handing notes, I sat back and listened as this new friend shared his story. “I was born here in Fresno in 1945 and immediately given up for adoption. Sixteen days later my parents took me home to Porterville where dad was a barber and mom a homemaker. My mother of fair complexion and red hair had the brown-eyed, black-haired boy she had always dreamed of. We lived there until dad bought a barber shop on the corner of Echo and Weldon here in Fresno. Our first home was on the corner of Michigan and Clark—on the east side of Blackstone. Our elementary school was on the west side of that busy street. Walking to and from school was an ongoing adventure with parents on the east side of Blackstone constantly lobbying for a foot bridge that never got built. Dad was a fisherman and took me with him in his aluminum boat. Both mom and dad were bird hunters and had shotguns. Every year we went to the Sacramento area to hunt. They loved it. I hated it. It was cold, foggy, and damp. I stayed in the car! Dad bought a television before there was a broadcast station. I watched the Indian test pattern and if that was not available, I watched snow. Later as a latch-key kid when mom was working at Sears, I came home from school and watched Nancy Allen’s Matinee Movie. Just down the street from our house was a small Mom and Pop store. They had an old coke machine where the sodas were kept cold in ice water. To remove a coke, you lifted the bottle and popped off the cap. What made this exciting was finding the right cap good for a free ticket to the Saturday matinee at the Crest theater. A city bus picked us up and delivered us down town. This matinee was a child’s delight. Chaos and mayhem ruled the day. We purchased ten cent bags of popcorn—not to eat—but to use as missiles to bombard anyone within reach. We went swimming in the Michigan Clark plunge. I guess life was just about perfect for me until dad passed away in 1954. I was nine years old. Then things literally went south. The barbershop was sold and mom and I moved south to L.A. where her people lived. When I was sixteen and mom was on disability, we came home to Fresno. We bought a house in the Olive Chestnut area. I enrolled in McLane High School where I graduated in 1963. It was time for me to go to work. I got a part-time job at Sears, graduated from 4C’s Business College, and then the part-time job at Sears turned into my full-time day job for the next thirty-six years. From Sears I moved to Thermo King. Like at Sears, I sell parts and this has been my day job for seventeen years and counting. My passion has always been food. For a good part of my life I was actively involved in the catering business. I indulged in this exciting pastime on evenings, weekends, and holidays loving every minute of it. I met the most interesting people. Primarily I tended bar, served food, and my favorite thing was being a taster and getting paid for it. I was working with Jimmy Pardini when President Reagan came to Fresno to endorse Pete Wilson who was running for governor. I was chosen to be his personal waiter and was the only one allowed to approach the president’s table. I still have the paper instructions: (1) no tomatoes on salad, (2) jelly beans next to his plate. Dale, after you and Gayle left last night I reminisced about a number of things and would like to add a P. S. to our interview. I remember watching out the window for the flash when the government was testing nuclear bombs. I know my folks loved me unconditionally and worked passionately to give me a good life. After my dad passed, I became the focus of my mother’s life. She was my role model and best friend. I remember her as a happy, laughing, hard-working woman who passed on to me her powerful work ethic. My family came to Big Red Church because The Reverend Gregg came to dad’s shop for his hair cuts. I attended off and on until mother passed away and officially joined the church in 2008. Shirley Carlson and Ruth Gadebusch were influential and encouraged me to be active in the ministries of the church which led me to serve as chairperson of Church Life. 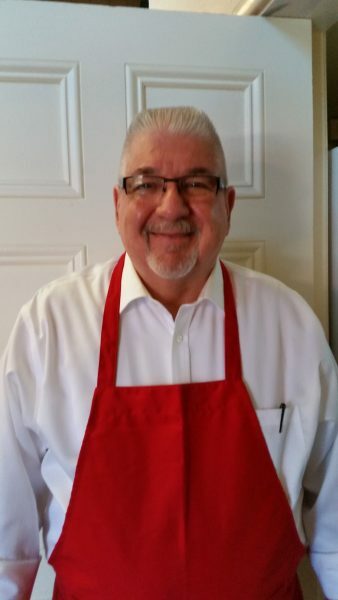 Today I enjoy putting on an apron and helping Paula Roberts in the church kitchen on special occasions. I love raisin pie. My favorite meal is prime rib with all the fixings. I read novels on my Kindle and still love watching TV—happy that I have more to watch than the test pattern of my youth! Dale Buchanan is a member of FCCF with a passion for stories and writing. In between penning his own memoirs, he is helping us get to know our members, one pew at a time. You have always been one of my favorite Big Red Church friends. You are a delight to work with or just visiting about most anything. Your life is a great example of what an adoption does to ones life. I want to thank both Dale and Gayle for writing about my story. I have always enjoyed the Big Red Church and the comfort the church and it’s members and pastors have given me. But i must say that the music has always been a very special draw for me. And i must say that i was always aware that i was adopted from a small child and knew i was wanted and loved by my family. No matter who you are, or where you are in life’s journey, you are welcome here. Find your church. Find yourself. Find your community. We are the Big Red Church! We’ve been in ministry in Fresno since 1883, but we believe God is still singing, and we are all part of the song! Our weekly email newsletter is called “The Grape Leaf” (our print newsletter is "The Grapevine"). This newsletter keeps you up to date on happenings at Big Red Church. Sign up below!